Meet the Visual Positioning System, or VPS. VPS pulls its data from the buildings and landmarks around you rather than relying on satellite location alone. By combining VPS with Street View data and some machine learning, Google Maps can work out where you are (and where you should be headed) even if your GPS lock has you placed three blocks north. It does have some quirks in it that you might not have spotted from Google’s brief demo last year. It’s also worth pointing out that it’s still labeled as an Alpha release—you should expect plenty of bugs at this stage, and plenty of improvements to come down the line. If you’ve got access, the AR mode is built right into Google Maps. For access on Android or iOS at the moment, you need to be one of Google’s Local Guides at level 5 or above (that’s someone who leaves a lot of reviews and feedback on Google Maps). As yet, there’s no word on when it’s going to go live for everyone, but here’s how it works from our testing. 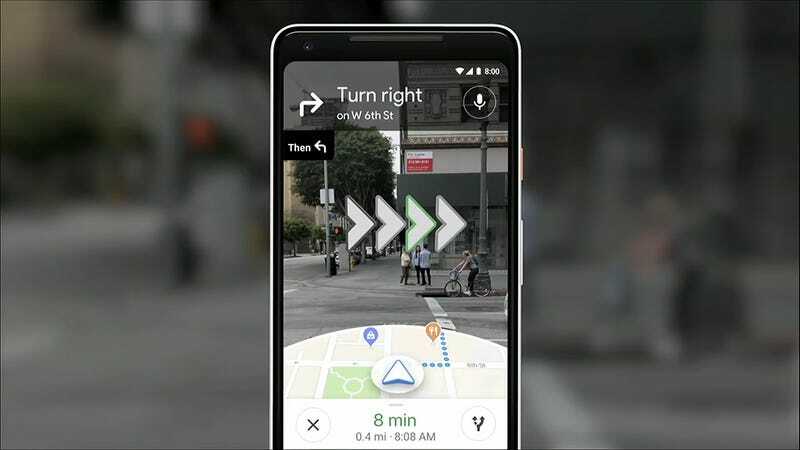 Fire up some walking directions as normal, and alongside the usual Start button you’ll also see a Start AR option—choose this to jump straight into augmented reality mode. You can also switch to AR later on your journey by tapping the little cube icon (bottom left) when you’re navigating normally. The AR prompts are hard to miss as you wander around. Open up the AR interface, hold your phone in front of you, and Google Maps asks you to point your phone’s camera at the buildings opposite. This works separately to the GPS lock, and helps the app get its bearings when GPS might not be reliable. Most of the time, the scene is recognized in a second or less, and you’re then into the AR mode proper. We did come across a few hiccups when buildings were particularly close (on narrow streets) or far away (on park greens) but by and large it was reliable enough—and remember this is still at the alpha stage, so we’re not even at beta yet. The AR mode recognizes buildings and directs you accordingly. When Google Maps knows where it is, you can really start to make use of the augmented reality features. Directions appear as either a discreet blue dot at the side of the screen, a blue sign confirming you’re on the right road, or (when you get close to a turn) huge animated arrows pointing you down the next road you need to make a turn on. This being AR, these giant floating pointers move around as you move yourself and the camera, and they work really well at helping you work out where you should be going. The AR removes all doubt about whether you’re facing the right way or whether you’re at your turn, and having the map also on screen underneath (in a smaller semi-circle) makes the directions even easier to follow. You’re encouraged to put your phone down and can enable AR mode with a tilt. When you need to be going straight ahead, again this is clearly shown in the app, and street names are included so you can double-check them against signs. When you get close, you’ll see your destination marked with a red Google Maps pin. This isn’t a mode you keep enabled and open all the time though—it’s something you activate every few minutes to get your bearings again. Tilt the phone down, and you go back to the normal view; tilt it back up, and the AR mode comes back into play. (You can adjust this behavior in the settings for Maps). The AR mode is still in development and doesn’t always work. The app itself will warn you not to keep your phone up in front of you for too long—the warning appears after only a couple of seconds or a few steps of walking, and it’s really not for extended use. The idea is you stick to the traditional navigation view and turn to AR only when there’s some confusion about where you’re headed next. In fact, it’s more for when you’re standing still rather than when you’re walking. Considering how unreliable GPS can be when you’re stuck between giant skyscrapers or other towering urban developments, we reckon this is something we’re going to be turning to a lot in the future. There’s no sign of the fox from Google’s demo yet. Think of it as an added bonus to walking navigation, rather than an alternative mode you’re going to spend a lot of time in: It’s something you’ll fire up at tricky intersections, or when you’re coming out of the subway, or when your phone’s GPS lock is getting seriously confused about where you are. Unfortunately, there’s no sign of the fox yet—the digital creature that appeared in Google’s demo at I/O 2018. Google must still be thinking about how best to guide people using the new technology, but it’s already impressive, and something you should switch on if you find it pushed out to your phone.